This may appear to be an innocent, heart-warming scene of schoolgirls waiting upon virtuous senior ladies with the vicar presiding from a distance. But a recent candid testimony from Rosemary Harvey, an ex-pupil of Cheltenham Ladies’ College – who came to do good works at St Hilda’s in Bethnal Green in 1965 when she was eighteen – tells a much more colourful story of how some posh girls got taken for a ride by a gang of sly East End women who knew how to enjoy a good knees-up. 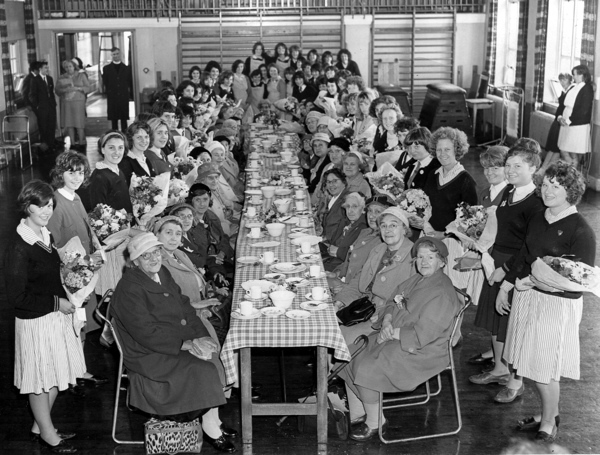 “Wye Women’s Institute had asked them down to tea. Quite a long way to go in a coach. Now as far as we knew, one of the staff would come and we would be there to help. But at the last minute, the member of staff got off the bus and said, ‘Have a good day!’ or words to that effect, and almost the last words this person said was, ‘Whatever you do, do not stop at a pub.’ and he told the driver. So, you know, we were out of London, and of course by about eleven o’ clock, we pull into a pub don’t we? What else? What else?! And they all get out, saying they had to go to the loo. Well, whether they did or not, they tanked up on liquid to replace it! They were in a pub, I mean to them, that was probably the highlight of the whole thing. All the women drank Guinness. They certainly got fairly merry. We did get them out of the pub, but with enormous difficulty. Then we went down to Wye and there was this lovely tea, all laid out by these very nice women with sandwiches with the crust cut off and fairy cakes and all of that. 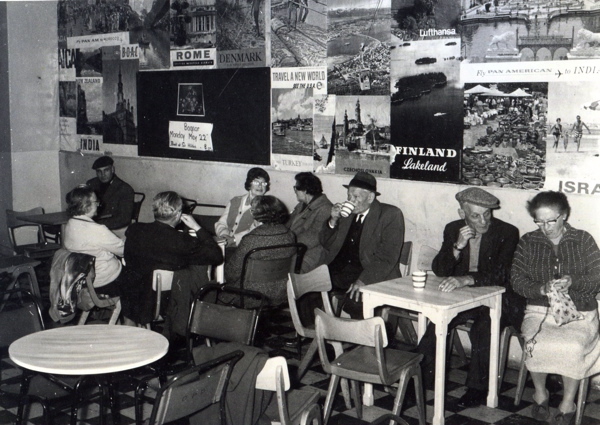 It wasn’t quite what they thought of as tea, but then I think they thought – rather like they thought about us – ‘They’re these strange people who live this peculiar way and we’d better be polite to them ‘cause they’ve made an effort’. But the tea wasn’t the thing. The advantage was seeing the countryside and it would start the memories of picking fruit when they were children. They remembered summers and going out and living in caravans and camping and camp fires and it was enormous fun. Of course, we had to park in the same pub on the way back, me having told the coach driver very firmly not to do that. ‘Yes ma’am,’ and it made no difference. They were rolling drunk by the time they got home and there were some very raucous songs which we knew were naughty, but we didn’t know why because of the innuendos. They would start singing and there was a cheerleader, she would get them going, and a few of them would be sick. We got them all home, but it was a bit of a nightmare. I don’t know whether the staff thought this would be a good idea to see if we were up to being social workers, or whether they just disliked us so much they thought, ‘We’ll get our own back on them’. But actually the people on the coach were sweet to us and they kept coming and saying ‘She’s alright,’ ‘She’s ok, she had a drink with us’ and ‘You know, she laughed with us’. Which is not what they expected, I think they expected us to be very severe, coming from a different sort of culture. St Hilda’s was founded in 1889 by Cheltenham Ladies’ College as a charitable settlement where pupils came to live and work with the people of the East End, and it was suggested to Rosemary Harvey that she might like to go for a couple of weeks and work alongside the staff there upon leaving school. Brought up on farm in Devon, Rosemary was shocked by the urban deprivation and atmosphere of violence that she encountered, yet looking back forty five years later, she values it as a vital experience in her growing understanding of the world as a young woman. “We thought we were going down there to help the poor but I don’t think we really had any clear idea about what we were going to do. Some of us dallied with the idea of going into social work which was a fairly new-ish idea then. You didn’t need a degree for it and it was slightly like going into nursing without actually having to do anything physical. There was nothing compulsory about going to St. Hilda’s, it was a bit like work experience really. The place wasn’t as multi-cultural as it is today of course, but there were quite a lot of Jewish families there which tended to keep to themselves a bit. And there were black families, they had a much more outgoing louder lifestyle. Lots of drumbeats and lots of music everywhere and lots of smiles and that sort of thing. They were very well integrated as far as one could see. One didn’t expect them not to be, there was no expectation that people wouldn’t be accepted. So quite fun, quite different cultures. A lot of people though, had lived their lives in Tower Hamlets, but their children, who had made good, moved out. 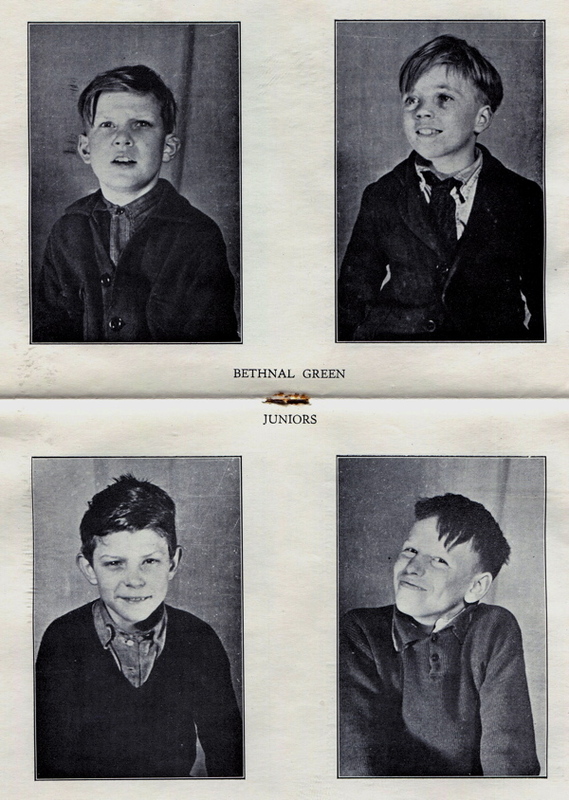 Hendon was the place if their children were successful, and there would be these big photographs of their children, saying you know ‘He’s now become a doctor,’ or a teacher or whatever and ‘They moved to Hendon’. ‘Do they come back and see you?’ Very often it was ‘Not often.’ You got the impression they were ashamed, they’d moved up the social scale. I can remember elderly people who were very proud of their children and not critical that they didn’t come, ‘Yes, oh yes, of course they come, they came for my birthday last year.’ And that to us seemed very strange, because families are families. 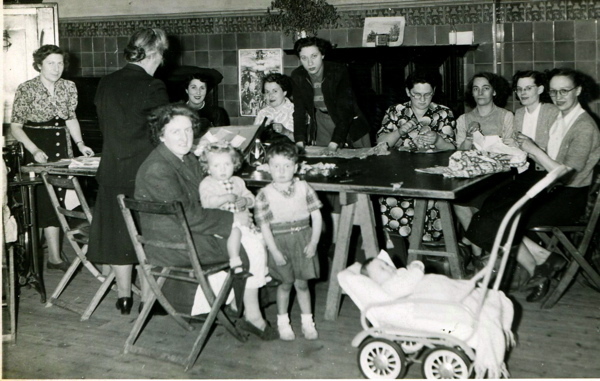 Rosemary’s experience was collected as part of an oral history project run by St Hilda’s East Community Centre, the contemporary incarnation of the St Hilda’s Settlement, still serving the people of the East End today. 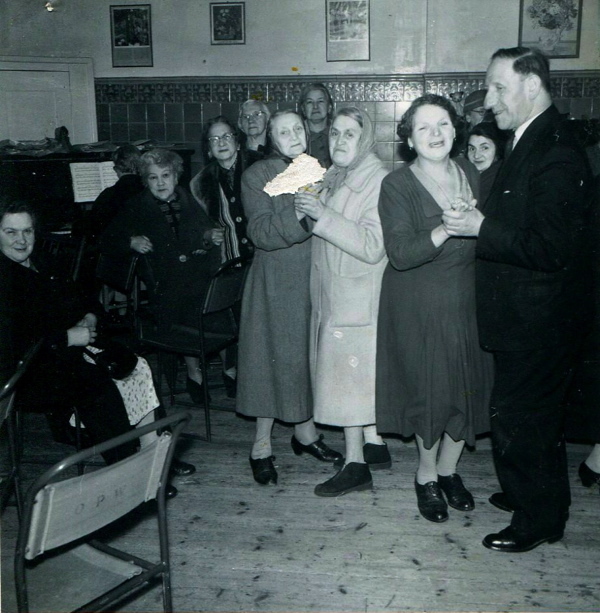 Alongside the pictures of the notorious ladies’ bus trip, it is my pleasure to publish a few other choice images from their archive because in spite of St Hilda’s mission to address deprivation, most of these beautiful pictures celebrate the joy it engendered. 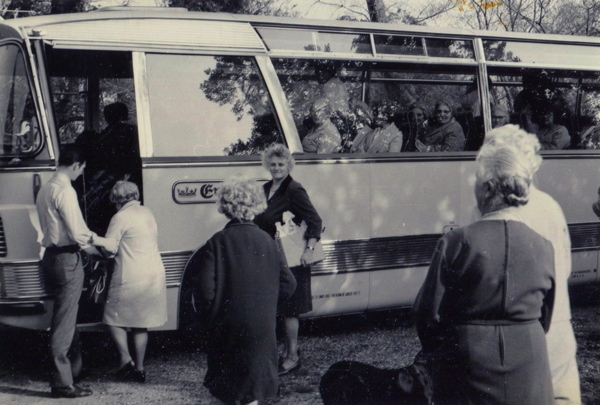 Ladies setting out on a day trip from St Hilda’s in anticipation of an intoxicating adventure. At St Hilda’s, travel posters illustrated the fantasy of exotic destinations while a day trip to Bognor Regis was advertised on the noticeboard. 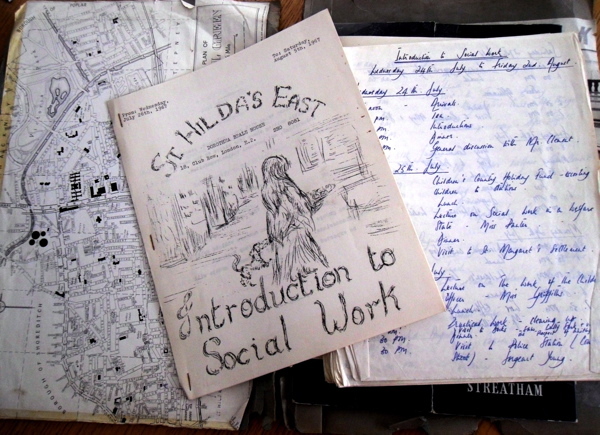 Documentation provided as induction to social work at St Hilda’s. 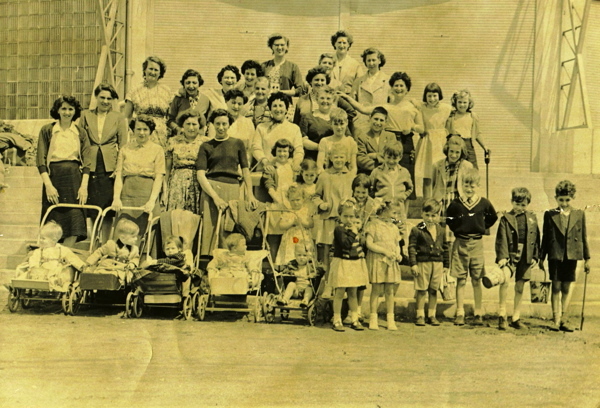 A young mothers’ trip to the seaside. 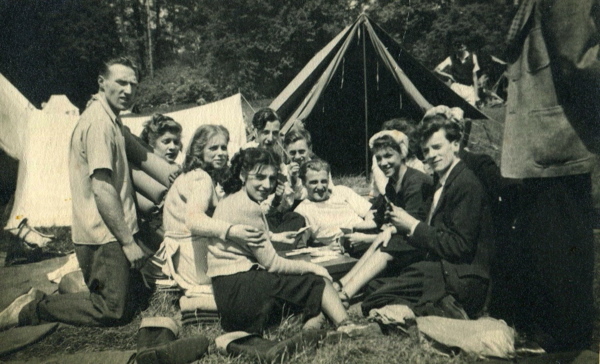 A camping trip in the nineteen forties. 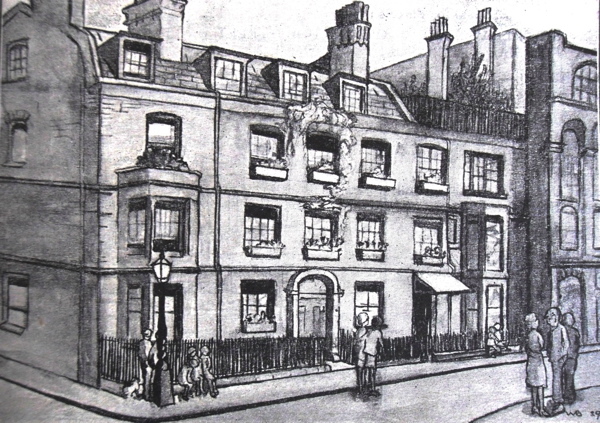 St Hilda’s opened in Old Nichol St in 1898 as the Incorporated Cheltenham Ladies’ Guild Settlement. there’s a huge debate here in the US over the idea of citizens’ journalism, which the internet is said to facilitate. i’m thinking your work is the best example i know. don’t ever stop. A forebear of mine was educated at Miss Buss’ school in London, then Miss Beale’s establishment in Cheltenham. She returns to be Head Mistress of the Central Foundation School, in Spitalfields, retiring in 1928. 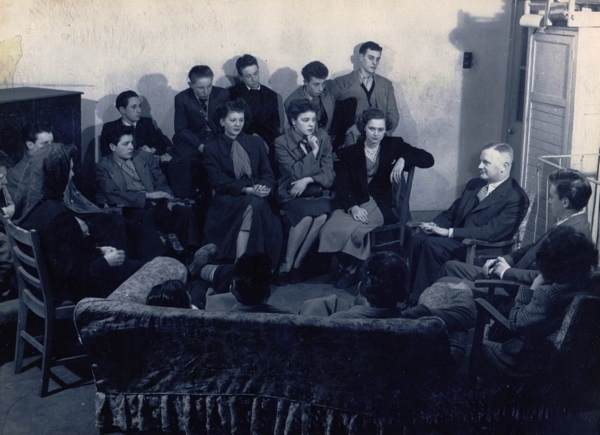 Is St Hilda’s the connection? I would be interested in any information which might help me answer this question. 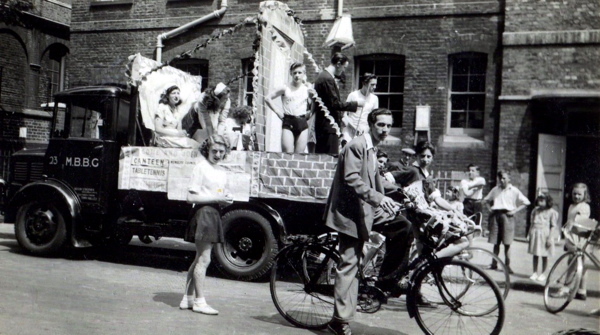 I was a member of St Hilda’s Club in the early 1950′s. I have a copy of those attending the 1954 Christmas party and am willing to share.